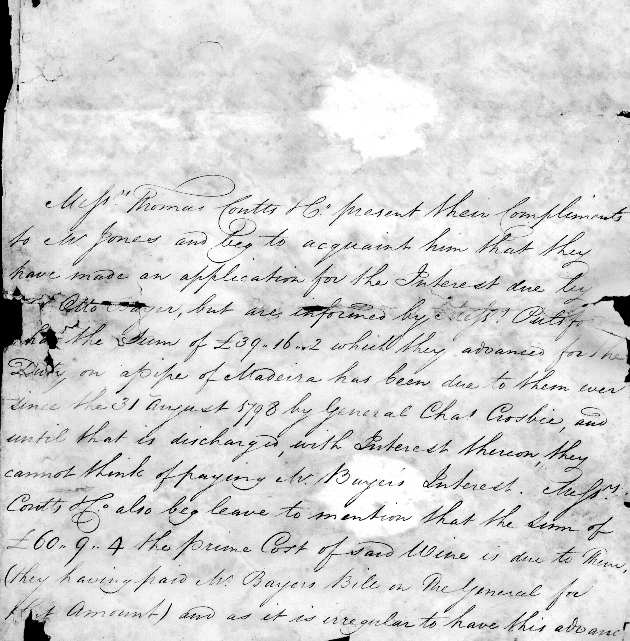 From the William Crosbie Estate Papers, http://web.uflib.ufl.edu/spec/manuscript/guides/crosbie.htm: The William Crosbie Estate Papers, dated 1792-1816, include correspondence concerning Crosbie's estate and the land of his agent/manager, John Otto Bayer, in Antigua. The letters document the activities and attitudes of plantation operators and slave owners in the English Caribbean colony of Antigua around the start of the 19th Century. The letters mostly concern financial and operational matters pertaining to the plantations, such as expenses, property values, debts, loans, securities, deeds, slaves, stock, crops, rum and sugar. Other correspondents and individuals referenced in the documents include Lord Moira, Admiral McDouall, Gilbert Jones (esquire), Colonel Handfield, John Crosbie (heir), Charles Crosbie, James Wood Bursar (St. Johns, Cambridge), Lady Amelia Carpenter, Colonel Knox, General Marsh, the Duke and Duchess of Newcastle, and Baron Deimar. The papers are filed chronologically. t' ;** -' '1 "